Providing you the best range of ss y strainers with effective & timely delivery. Our SS Y Strainers are designed for longer service life and high performance even after consistent use in extreme and testing environments of high temperature and pressure. 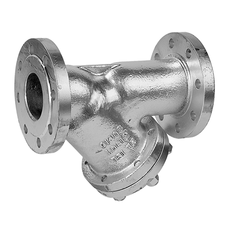 Our Y-strainers are designed for improved efficiency and trouble free service. These are easy to install and prevents the introduction of foreign matter in the pipelines. Looking for SS Y Strainer ?